In view of the preliminary character of my search for artistic resemblances, evidence of another kind from the tapestry itself hinting at its having been produced at Saint-Florent of Saumur is all the more welcome. Rather than artistic this is what might be called narrative evidence from the story it presents; what the designer has chosen to portray, how he has portrayed it, and how he intended it to be understood. 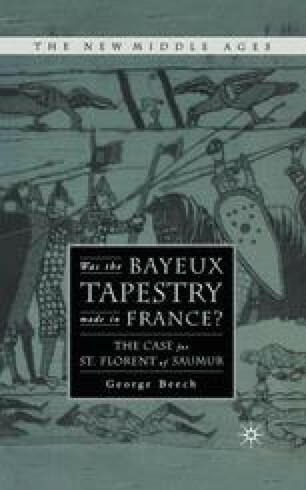 This evidence comes not from the entire tapestry but from a single episode, the Breton campaign (or expedition, or war). This sequence is the only part of the tapestry with any ostensible connection with the abbey of Saint-Florent of Saumur in that it is centered on Dol in Brittany, the castle of Abbot William and his father Rivallon. Hence an examination of it was obligatory. With six scenes (figures 5.1a–5.1f) the Breton segment occupies about one tenth of the whole, admittedly only a small part, yet this campaign has puzzled modern scholars as much or more than any other episode in the entire tapestry due to its apparently incomprehensible deviations from the standard contemporary written source for the events it portrays. Indeed these disparities raise a question about the function or place of this sequence in the tapestry as a whole. Why was it included? What purpose was it intended to serve in the story of William’s conquest of England?